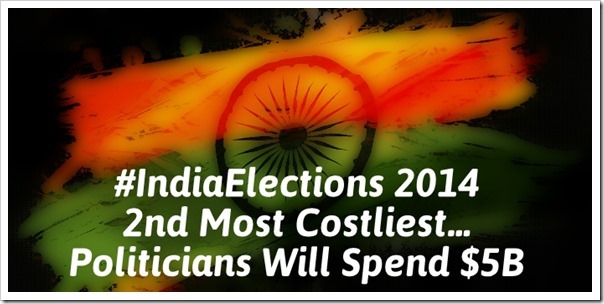 Indian Elections World's 2nd Costliest; Politicians Will Spend INR 30,500 Cr! A new research by Centre for Media Studies have revealed that Indian politicians are expected to spend around $5 billion or Rs 30,500 crore for campaigning during this year’s elections. This huge amount is second only to 2012 US Presidential elections expenditure, which was world’s costliest election till date when $6-$7 billion was spent. Compared to 2009 General Elections, this amount is almost three times of the total expenditure done by various parties and support groups to entice voters. This huge expenditure on election campaigning can also give a boost to slow Indian economy, which is witnessing lethargic growth since last decade. Economists have predicted that 5% annual growth is the worst slump since 1980s. $5 billion spending by various political parties can benefit large number of industries such as media groups, FMCG market, automobile industry and brewers such as United Spirits. Madison Media has predicted that Indian advertisement industry can witness infusion of $800 million during the election season, especially regional circulations and TV channels. Indian General Elections – 2014 will start from April 7 and conclude on May 12, with counting starting from May 16th and the formation of new government expected to be over by May end. Election Commission of India has set a limit of Rs 70 lakh for election campaigning by various candidates, but, it is widely known facts that actual expenditure is more than 10 times of this limit. Political parties are known for distributing cash bundles, alcohol and even cars during elections. In the last 3 years, Election Commission has seized Rs 198 crore from various politicians as concealed cash which would have been used for influencing voters and their votes. Cash has been seized from milk vans, helicopters and even funeral vans. The recent assembly elections witnessed newer methods of distributing money such as mobile recharge and money hidden within newspapers. It is our sincere request to all Indian voters: Never get influenced by these cheap gimmicks during elections. Each and every vote is a stepping stone towards a more powerful and developed India; it should not be sold so cheaply. Do share your opinion on this news by commenting right here!